The most crucial component of a modern XPS instrument is its software, which handles all aspects of operation, data interpretation and reporting. 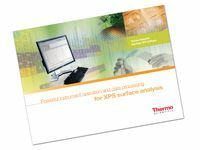 All Thermo Scientific™ XPS systems use Thermo Scientific™ Avantage™ software for instrument control, data processing, and reporting. Whether working in a dedicated research lab or in a multi-user environment, analysts of all abilities can rely on the flexibility, feature-set, and intuitive operation of Avantage software to enable to obtain the maximum information from their samples.